Jamshedpur faced Chennaiyin FC at Chennaiyan’s last home game in hopes of salvaging the much needed three points to keep them afloat in the race to the top 4. As it stood before the match, Jamshedpur at 23 points needed two wins from their last two matches and hope that NorthEast loses their next one against Kerala Blasters. Having already gone through an injury-prone season Jamshedpur went into the match in the absence of Robin Gurung who was stretched off in the last game against Pune City FC. 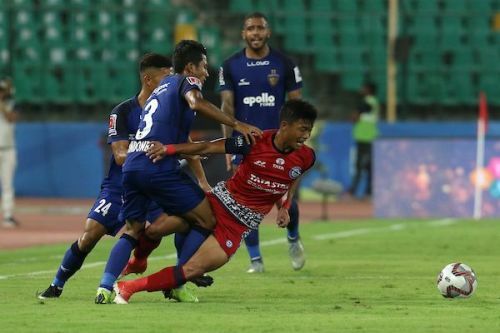 Sitting at the rock-bottom, Chennaiyin FC had nothing but pride to play for in a season which had unfolded a pretty dismal performance for the defending champions. With just two wins in 17 games, Gregory Nelson hoped to give the home crowd something to cheer for in their last home game of the season. The game saw yet another mediocre standard of play in the Indian Super League with both sides creating very few chances during the games. With a knife to their neck, one would have expected Jamshedpur to go full throttle in a do-or-die match but it seemed that the team is okay to finish the season with a 5-place finish. 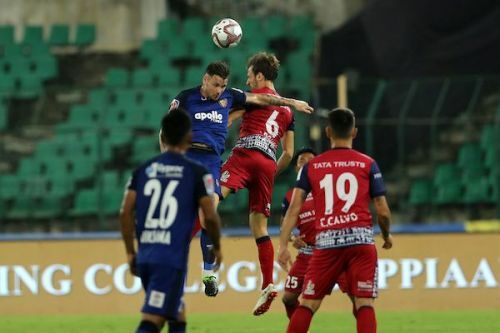 The team showed no urgency in getting a result out of the game and in fact were dominated by Chennaiyin FC in major quarters, leading them to a 0-0 finish at the final whistle. The draw further confirmed the top 4 for the ISL season 5 as NorthEast joined Bengaluru FC, FC Goa and Mumbai City FC for the knockout phase of the tournament. Here are the 5 talking points from the game. Jamshedpur FC has been plagued with their attacking worries this season as even after continuous changes in the forward line they’ve not been able to find a solution in front of goal. Tim Cahill had been the alone option for the Men of Steel this season and now with even he being injured, Jamshedpur was left with no other option than to rely on the midfielders and the wingers to do some magic for them. With Sumeet Passi left out of the squad, Jamshedpur went into this match with Farukh Chaudhary infront of goal who, otherwise serve as a winger. The onus of scoring was also left to Spaniard Sergio Cidoncha and Jerry Mawhmingthanga in a 4-2-3-1 formation. Jamshedpur also relied heavily on midfielder Mario Arques to chip in on the attack. Unfortunately, the lack of a proper striker and an overreliance on the midfield resulted in Jamshedpur left wandering throughout the pitch for the entire duration of the match. The miscommunication and improper coordination between the players resulted in one of the poor displays of football from Jamshedpur this season. The defensive pair of Mailson Alves and Eli Sabia also proved to be too good for the Caser Ferrando’s men as they move towards the last game of the season with nothing but pride to play for. One would hope that Jamshedpur takes note of this and keeps the search for a striker as a matter of high priority for the next season.